The Bald Head Island Club features a recently re-designed Tim Cates golf course, 25-meter pool, regulation play tennis courts, a world-renowned professional croquet court, fitness center, Pro-Shop and a variety of dining options. Most of the rental homes and The Marsh Harbour Inn have temporary club memberships available for vacationers for an extra fee. Expect the finest from one of the finest country clubs on the East Coast. 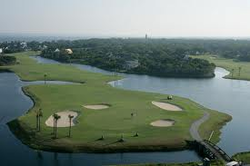 In addition to the fine club facilities, Bald Head Island Club hosts a number of events and activities for children and adults. Island Retreat Spa and Salon offers a soothing atmosphere for enjoying a wide range of services, including facials, pedicures, massages and even special services for the bride on her big day. Whether you're looking for a solitary retreat or an afternoon with friends, Island Retreat offers services designed to help you rediscover your natural beauty and inner peace.